At Texas Highways, we’ve learned a few things over the years about spring wildflowers in Texas: We have lots of them, many kinds, all over the place. We’ve learned this, too: Once Mother Nature shakes off winter’s chill, there’s no better way to celebrate the new season than with a wildflower-focused road trip. This year, we picked four broad regions of the state and tracked down some of the best places to see wildflowers within each one. 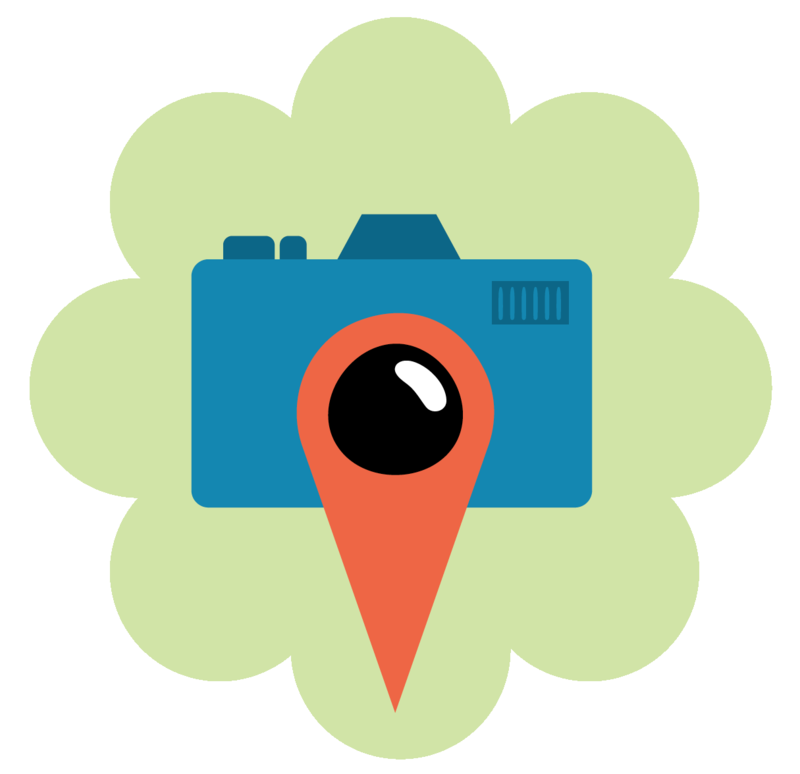 You can mosey over to one or two spots when you have a little free time, or pack up the car, take a few days, and cover an entire region—or two or three. 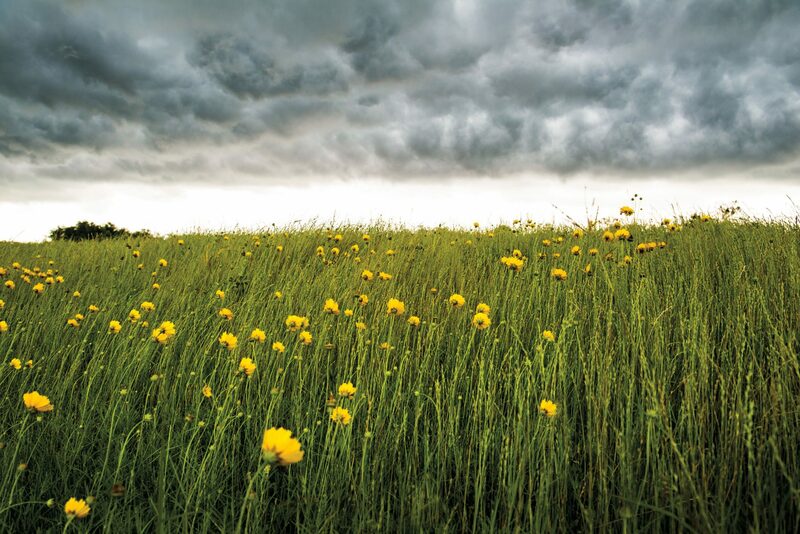 Remember that many variables affect when, where, and how many wildflowers bloom each year, especially rainfall and temperatures the previous fall and winter. Conditions vary greatly across the state, of course, but count on beautiful scenery and friendly fellow wildflower seekers wherever you go. 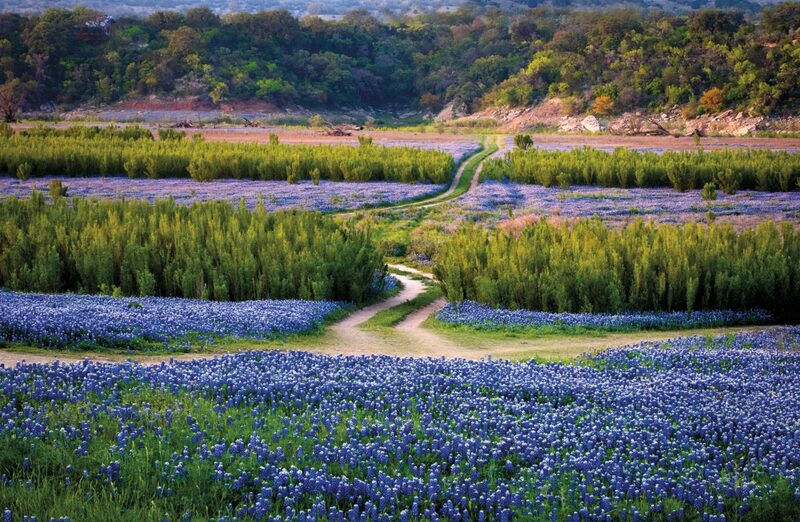 The Texas Hill Country boasts some of the most picturesque swaths of wildflowers anywhere, riotous blends of colors set off against granite outcrops, cacti, and sparkling lakes. 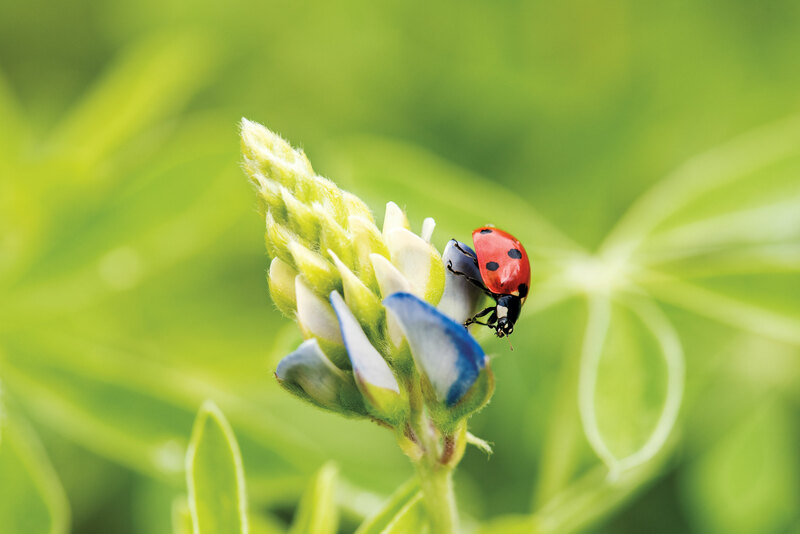 One of the best places to find them, Lyndon B. Johnson State Park & Historic Site near Johnson City, boasts more than 400 species, including iconic bluebonnets, winecups, evening primrose, scarlet sage, Indian paintbrush, coreopsis, and firewheel. Find impressive displays around the Visitor Center Complex and along the trail leading to the Official Texas State Longhorn Herd and the historic Danz Cabins, which date to 1860. All dressed up and need guaranteed flowers to back-drop that photo, quick, before the kids melt down? Wildseed Farms on US 290 just east of Fredericksburg has more than 200 acres of wildflower fields awash in seasonal blooms, as well as a gift shop, walking trails, a biergarten, and a winery. The LBJ National Historical Park includes a complex in Johnson City and the LBJ Ranch area 14 miles west. At the former, the Johnson Settlement typically offers good flowers, easily accessible on a short trail. Interpretive ranger Dave Shaeffer also recommends driving the nearby Willow City Loop. To get there from Fredericksburg, drive north on State Highway 16 for about 13 miles, turn right on Ranch Road 1323, then turn onto Willow City Loop. 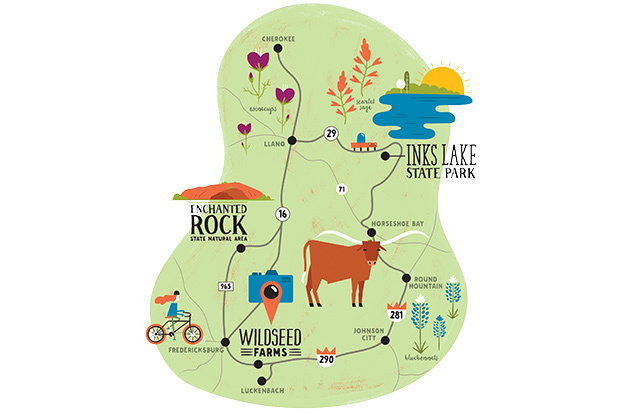 Consider exploring the Willow City Loop on two wheels with Texas Bike Tours, which offers four-hour rides on this route or one of the same length to Luckenbach, following back roads and the Pedernales River through fields of wildflowers, complete with a picnic at the historic Luckenbach General Store and Dance Hall. Texas Bike Tours founder Deaton Bednar says if neither of those routes strikes your fancy, she loves creating custom itineraries. Another option, new this year: the Fredericksburg Trolley Tour outfitter added a three-hour wildflower tour, starting from the Fredericksburg Visitor Information Center. Once Mother Nature shakes off winter’s chill, there’s no better way to celebrate the new season than with a wildflower-focused road trip. An hour or so north at Inks Lake State Park, ranger Jasmine Scott recommends checking out abundant bluebonnets at the Pecan Flats trailhead along the Lake Trail, a sea of yellow sneezeweeds and tunnels of white beebush along the Devil’s Backbone Trail, and firewheel at the trail’s junction with Valley Spring Creek Trail, which also has purple phlox and giant spiderwort. The park’s Woodland Trail sports Indian paintbrush, firewheel, and Hudson flax. For details about Fredericksburg Trolley Tours, Texas Bike Tours, LBJ National Historic Park, LBJ State Park & Historic Site, and Wildseed Farms, see visitfredericksburgtx.com. Inks Lake State Park: tpwd.texas.gov. 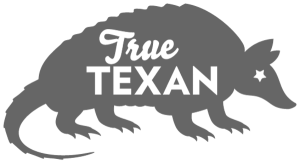 Llano Chamber of Commerce: llanochamber.org. Briley Mitchell, executive director of the Llano Chamber of Commerce, calls State Highway 16 between Llano and Cherokee the prettiest road in Texas. He recommends stopping at Baby Head Cemetery, about 12 miles north of Llano, to get out and walk among the wildflowers. In fact, wildflowers grace many old Hill Country cemeteries, as do blooming trees such as Texas redbud and Mexican buckeye. Mitchell also recommends State Highway 16 south from Llano to Enchanted Rock for bluebonnets, prairie verbena, goldeneye phlox, Engelmann’s daisies, Indian paintbrush, and Texas thistle. He also suggests RR 2323 to Prairie Mountain and RR 152 between Llano and Castell. “We like to stress that Llano and Burnet counties were designated as the co-bluebonnet capital of Texas,” he adds. Spring carries little certainty in the desert, but when winter rains fall, the landscape responds with gusto. 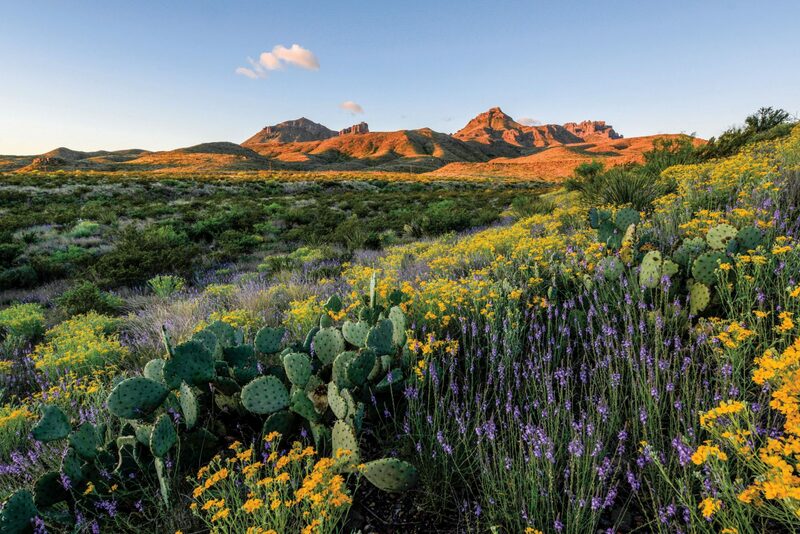 Southwest Texas’ unusual ecosystem offers plenty of variety, with entirely different landscapes as you move from low desert up to higher elevations. In Alpine, you’ll likely spy bluebonnets and other wildflowers by following the Loop Road (also called State Highway 223 or North Harrison) from East Avenue E past Sul Ross University to State Highway 118. On 118 north toward Fort Davis, look for yellow bladderpods, white-flowered peppergrass, and purple verbena; if you head south toward Terlingua, you’ll see Mexican buckeyes and flowering desert scrub in lower areas. Find your guaranteed photo backdrop at the Chihuahuan Desert Nature Center, just outside Fort Davis. In early spring, yuccas, agarita, patchy plume, and chokecherry bloom here as well as redbud and mountain laurel. In the Pollinator Garden, lantana, catchfly, mistflower, and primrose flower later in spring. About an hour south of Alpine in Big Bend National Park, spring flowers start blooming in late February along the Rio Grande and by late April in the Chisos Mountain foothills. The biggest concentrations of wildflowers pop up along paved roads, thanks to rainwater run-off. Drive along the park road west from Panther Junction in early spring for Big Bend bluebonnets, which often grow to be two or three feet tall. Make the drive again a few weeks later for showy cactus flowers of yellow, red-orange, pink, and magenta. Yuccas begin to flower in February, shrubs and small trees bloom in March and April, and ocotillo plants put out fiery-red tubular flowers beginning in April. Throughout spring, hikers usually find flowers on popular trails such as Mule Ears, The Window, and Lost Mine. 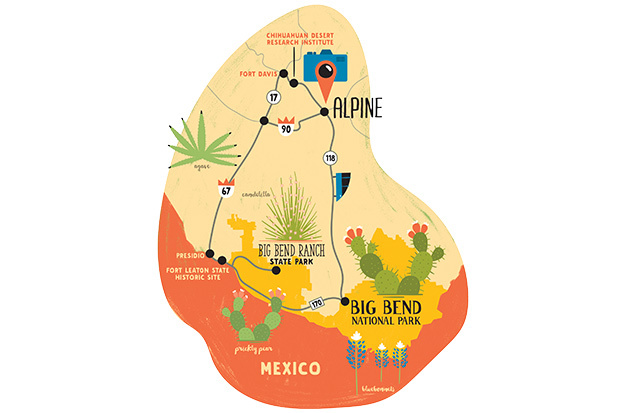 For information about visiting the Big Bend region, see visitbigbend.com. Chihuahuan Desert Nature Center and Botanical Gardens: cdri.org. West of the national park, FM 170, aka the River Road, snakes along the Rio Grande west from Big Bend Ranch State Park’s Barton Warnock Visitor Center to Presidio, Ruidosa, and Candelaria. Big Bend bluebonnets, bicolored fanmustard, sandbells, and yellow desert marigolds bloom along the road in February and March. Within the boundaries of Big Bend Ranch State Park, good wildflower stops include the Teepee picnic area, Closed Canyon Trailhead, Hoodoos Trailhead, and the Contrabando movie site. Blooming succulents and cacti in this part of the state include yucca and ocotillo in early April, followed by prickly pear, rainbow cactus, strawberry pitaya, and the rare Glory of Texas cactus. The candelilla shrub, a source of wax with tiny pink blooms, grows abundantly here, as does spiky lechuguilla, a small agave that puts up a red bottlebrush-like bloom. Hilly and mostly rural Washington County has long enjoyed fame for its bounteous blooms of bluebonnets. Reliable fields of bluebonnets cover Old Baylor Park in Independence, site of the original Baylor University, along with Indian paintbrush, blanket flower, thistles, and coreopsis. This peaceful park has walking trails, picnic tables, and panels with historical information. 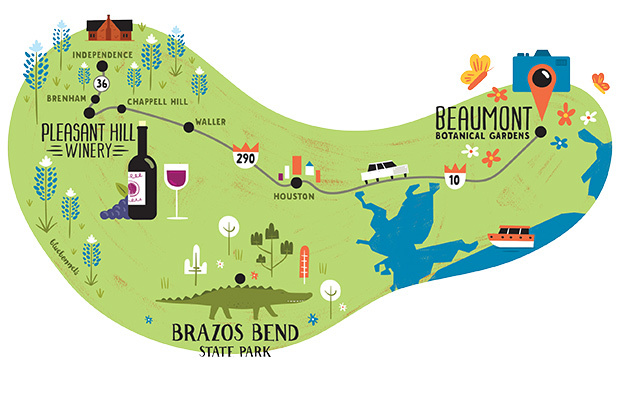 Pleasant Hill Winery, just south of Brenham, overlooks vineyards surrounded by fields of bluebonnets. Come for tours and tastings Saturday and Sunday, or buy a bottle or glass of wine and enjoy the view with a toast. For that got-to-get-it-today photo, head to Beaumont Botanical Gardens, which has a native Texas garden with blooming lantana and salvia and a monarch butterfly waystation. For information about attractions in Washington County, including wildflower sightings in spring, see visitbrenhamtexas.com. Brazos Bend State Park: tpwd.texas.gov. Katy Prairie Conservancy: 713-523-6135, katyprairie.org. Bluebonnets fill every nook and cranny of Main Street in nearby Chappell Hill and several pastures in Washington-on-the-Brazos State Historic Site; you’ll also likely find flowers on the park’s Wildflower Loop Trail just past the old Washington town site. Tallgrass prairie was once a defining characteristic of the Texas coast. These days, the Katy Prairie Conservancy helps protect more than 20,000 acres west of Houston, including the 155-acre Indiangrass Preserve, whose 1.5-mile trail opens to the public Tuesday, Friday, and Saturday. Community Conservation Director Jaime González says visitors will likely find firewheel, blue sage, Indian plantain, rosinweed, Indian paintbrush, and bluebonnets. Washington county has long enjoyed fame for its bounteous blooms. Southwest of Houston, tallgrass prairie still covers much of the western border of Brazos Bend State Park. Wildflowers at home in these prairie landscapes include plains coreopsis, lemon beebalm, prairie coneflower, wild indigo, and Carolina buttercups. The park’s natural history interpreter, Monica Stewart, suggests walking the 1.25-mile Prairie Trail, which has an elevated viewing platform great for taking panoramic pictures. The Texas Panhandle covers a high, sloping mesa, an extension of the North American High Plains also known as El Llano Estacado or the Staked Plains. The natural vegetation is primarily shortgrass prairie, which includes sideoats grama and big bluestem grasses, firewheel, American basketflower, and fragrant sumac along with mesquite, cottonwood, western soapberry, and hackberry trees. Clark Gardens in Weatherford has “bluebonnets by the thousands,” says Director Carol Montgomery, making it this area’s go-to spot for traditional wildflower snapshots. The gardens open daily March 1-July 4. 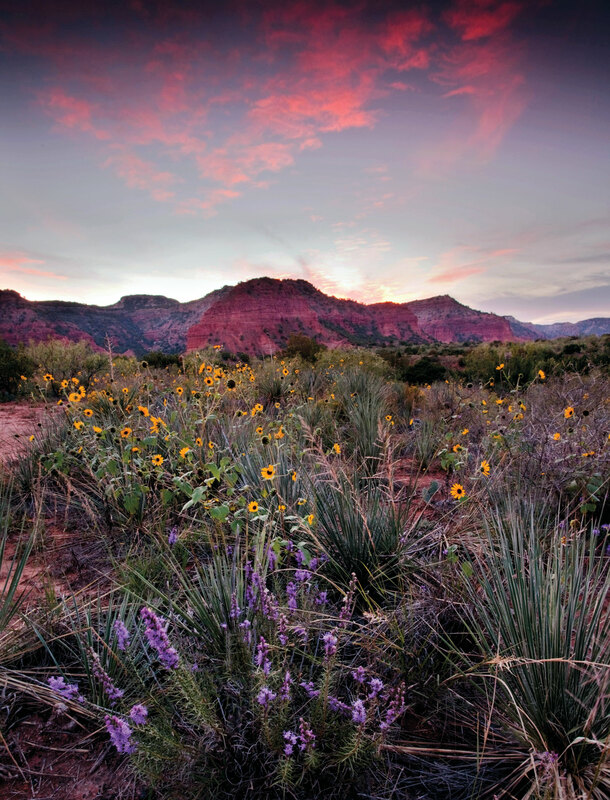 Spring wildflowers show up throughout Palo Duro Canyon State Park, according to Interpreter Jeff Davis. “What you see will depend on where you are,” he adds, including sand lilies and tansy asters in the higher areas; and fleabane daisies, firewheel, American basketflower, paper-flower, blackfoot daisy, sand sage, yucca, and prickly pear in the canyons. 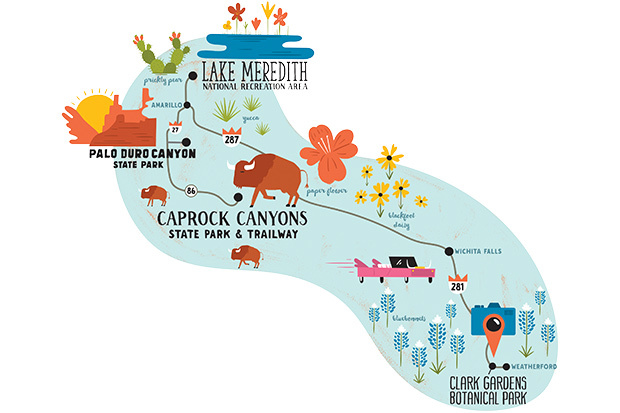 Trails offer great bloom-spotting, particularly lower trails such as the mile-long Paseo del Rio, which follows a fork of the Red River, the Comanche or Kiowa trails, Rojo Grande, and Juniper Riverside trails. Palo Duro Canyon State Park: tpwd.texas.gov. Caprock Canyons State Park & Trailway: tpwd.texas.gov. Lake Meredith National Recreation Area: nps.gov/lamr. About 90 miles southeast at Caprock Canyons State Park & Trailway in Quitaque, restoration efforts continue to turn the area back into original native rolling plains and prairie. Park Superintendent Donald Beard points to a 700-acre prairie in front of the headquarters that blooms with wildflowers and recommends the 2-mile Eagle Point and 3-mile Canyon Rim trails for good wildflower sightings. Flowers that sharp-eyed hikers may see include bladderpods, lemon horsemint, Mexican hat, white and rose prickly poppy, evening primrose, and firewheel. Some 125 miles north of Caprock Canyons State Park, gayfeather, daisies, and yucca bloom at Lake Meredith National Recreation Area. “We’re a canyon park, so we don’t get huge swaths of flowers,” says Chief of Resource Management Arlene Wimer, but she says hikers can see a variety of wildflowers, including Tahoka, chocolate, and Engelmann’s daisies. Wimer recommends South Turkey Creek Trail, which winds more than 6 miles around nearby hills out to Turkey Creek, and the Harbor Bay Trail, 5.23 miles from Harbor Bay to Meredith Way, over gently rolling hills, steep slopes with steps, and switchbacks. The park’s Plum Creek area bursts into yellow with prairie zinnias and asters.